Ever since watching The Secret of Nimh when I was a child I have loved mice that fight. 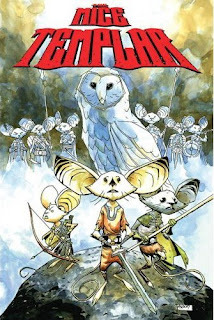 There has been a recent rash of anthropomorphisized mice with Mouse Guard, Fables' Mouse Police, and now The Mice Templar. While The Mice Templar holds some commonalities with Mouse Guard in that they are both comics/graphic novels it more than sets it self apart. At its heart The Mice Templar is a coming of age story, but the authors have created a rich mythology behind the Templars. The Mice Templar begins 20 seasons after a schism within the ranks of the Mice Templar and which destroyed their group. The organization had originated more than 1,000 seasons in the past by the mythical warrior Kuhl-En in service to the God Wotan. The mad King Icarus is in league with rats and weasels to subjugate the mice populace. After the schism which claimed the lives of most Mice Templar some of remnants have gone into exile while others are in league with King Icarus. Rats come to Cricket Glen to enslave the mice citizens as they have done to other settlements. During the attack Karic, a young mouse, is separated from his family while fighting the rats. As the battle rages Karic falls into a lake and was rescued by The Salmon of Wisdom who bequeaths him a magical water pouch, which turns out is cooler than you would think. The Salmon and many other elements of the story are based on Celtic mythology which are used to great effect. The Salmon also tell Karic he is to become the new Kuhl-En and is destined to rebuild the Templars. Karic leaves the village with a mysterious mouse named Pilot the Tall, who is an exiled Templar. Karic's family and friends are taken prison to the Capital where many other tribes have been gathered. Karic and Pilot travel the Barren lands as they are being followed. Along the way Pilot takes him on as his apprentice and teaches Karic the way of the Templar. They battle ravenous ant-like creatures, which the Templars were supposed to have driven from the land many generations ago. Together they travel to the Great Ash Tree, where an enclave of mice Templar priests known as The Readers of the Wheat live. Pilot hopes for Karic to be taken in for both their protection. It is revealed that Pilot is not trusted by this group and and may be the one to cause the attack on Karic's home. Pilot is driven off, but Karic is taken in as the Readers believe Karic could lead to the Templar's flourishing again. 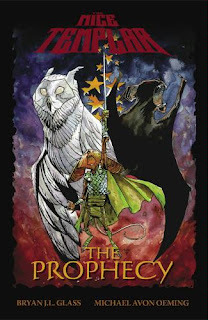 The Mice Templar is bound to become a modern classic that is cherished and re-read for years. It would certainly make for a good movie or animated TV series. The artwork is gorgeous as is the packaging which includes a nice ribbon bookmark a feature I didn't realize until I needed one. (Hey there's a ribbon!) The hardcover edition comes with loads of extras including a brief history of the Templars, their mythology, as well as the original Templar comic from 2003 that was the basis for the series. This is definitely in the same class as the Absolute Sandman's DC is releasing. The paperback version will be released in June, but I do suggest picking up the hardcover as it is truly beautiful to behold. I give The Mice Templar 9.25 out of 10 hats. Do yourself a favor and pick it up as you'll be sure to share it with your children when they are ready. Check out a free Mice Templar short story here. This looks interesting but I'm confused: is this a book based on a comic, or a comic? It is a comic or graphic novel depending on how serious you are about them. Comic is fine with me. 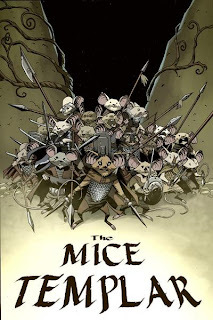 The other series I mention Mouse Guard is also a comic. I'll add a line so it is a little clearer as I only mention it in the tags. Thanks for coming to my blog and showing me this one! I was unaware of this and it does look great. I will have to check it out! I too loved the NIHM story when I was little.